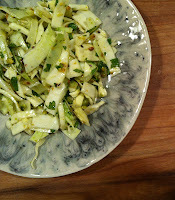 A raw cabbage salad is so underrated despite its amazing crunch, flavor, ease of preparation, and longevity in the veggie drawer. I often eat it shredded with just kosher salt and extra virgin olive oil, sometimes a squeeze of lemon, but nearly as easy to jazz it up a bit more. In this case in addition to the salt and olive oil I tossed it with some chopped fresh mint, pistachios, lime juice, and a generous sprinkle of my favorite Indian spice, garam masala. Just as easy with cucumber, tomato, kalamata olives, and crumbled feta. The point is, once you start eatting cabbage raw you’ll never be caught without one in the fridge again.